A dental crown is a “cap” that is placed over the entire tooth used to restore the tooth to its original color, size, and shape to improve the overall appearance of the tooth itself. A crown is a resilient restoration solution, giving added protection and durability to the tooth structure. Additionally, the use of a dental crown offers the patient a longer life of the tooth than would be had if fillings or other types of restoration options were implemented. The three most common types of dental crowns used in restorative procedures are: all porcelain, porcelain-fused-to-metal, and gold. All porcelain crowns offer the patient the most aesthetically pleasing option of the selections. However, all porcelain crowns are not as strong as some of the other options and therefore are usually only recommended for the front teeth. Porcelain-fused-to-metal is a crown composed of a metal-based filling encased in a porcelain baked outer covering. This offers the strength that metal crowns have to offer with the visual appeal of porcelain. With gold crowns, less of the remaining tooth needs to be removed in order to place the crown. Also, there is less wear on opposing teeth compared to other dental crown options. Gold crowns are very durable and able to withstand forces from chewing, therefore they are recommended for back teeth. Gold crowns generally last the longest in terms of wear and tear. If your Clark Family dentist determines a dental crown is needed to protect a tooth with significant decay present you will be presented with the most suitable options available to you. Standard dental crown procedures necessitate on average two appointments. The first, impressions will be made for a temporary crown and then installed. Also, molds will be taken and sent off to create your final product. During your first visit, we will prepare the tooth for crown placement. This requires the use of local anesthesia the numb the area prior to removing decay. 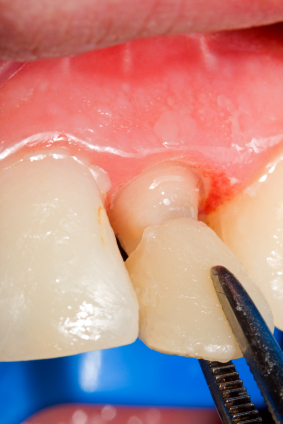 Once all of the decay is removed, the tooth will be shaped to fit the temporary crown, which will be cemented into place with a temporary adhesive. Your bite will be checked for proper function and you will be sent on your way. Approximately two weeks later, you will return for your second appointment, where your permanent crown will be placed. Before permanently placing the restoration we will clean the tooth and check for proper bite and spacing with the new crown. Once the fitting passes the examination, it will be placed permanently. Once your crown procedure is complete you will be provided with specific discharge instructions, that you should take special care to follow in order to ensure a healthy start for your new tooth. Remember to maintain routine dental cleanings as well as exams, and always practice the proper oral hygiene to keep your new and existing teeth sparkling! Give us a call today at (541) 604-2900 to schedule an appointment. We can go over your options for dental crowns and address any issues you may be having.